CAIMIN (CAMMIN) of INNISKELTRA, (Seventh Century), St. Caimin lived as a hermit on an island in Lough Derg in Ireland. 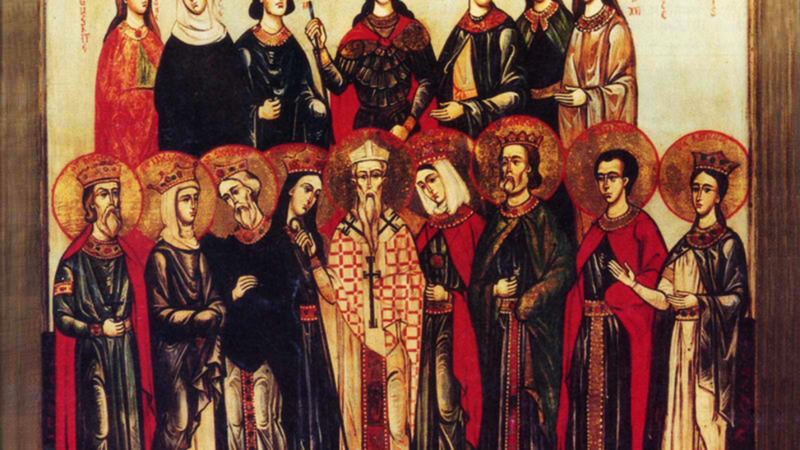 However, his solitude was soon interrupted by the many disciples who were drawn to him, so St. Caimin founded a monastery and church on the island of the Seven Churches for his disciples. St. Caimin is also believed to have worked with St. Senan (8th March). A fragment of the Psalter of St. Caimin , copied in his own hand, is still extant. CAIRLON (CAORLAN), (Sixth Century), an Irish abbot who later served as Archbishop of Cashel. There is a legend that he died and was restored to life by St. Daig Maccairill (18th August). When St. Cairlon had been made Archbishop of Cashel, St. Daig Maccairill placed himself and his monks under his rule. DOMANGARD (DONARD), the patron saint of Maghera, Co. Down, St. Domangard lived as an anchorite on the mountain now called Slieve-Donard, and reposed towards the end of the fifth century. HILDELITH, an English princess who spent most of her youth in Gaul and received monastic tonsure at either the Abbey of Notre-Dame-des-Chelles in Chelles (about 25 km / 15 mi east of Paris) or the Abbey of Notre-Dame de Faremoutiers in Faremoutiers-en-Brie (about 55 km /34 mi east of Paris). St. Erconwald of London (30th April) asked her to come to Barking, to train his sister St. Ethelburgh (11th October). St. Hildelith then stayed on as a nun, and became Abbess upon the repose of St. Ethelburgh. An educated and cultured woman, St. Hildelith was greatly admired by SS. Aldhelm of Sherborne (25th May), Bede the Venerable (25th May) and Boniface (5th June), she reposed circa 717. LATINUS of BRESCIA, , St. Flavius Latinus is traditionally considered to have been consecrated the third Bishop of Brescia in 84, succeeding his spiritual father St. Viator (14th December). St. Latinus ruled the See for thirty years before being arrested, tortured, and finally martyred in 115 during the reign of the Emperor Trajan (r. 98–117). MACARTAN (MACARTIN, MACCARTHEN), (Sixth Century), St. Macartan was an early disciple and faithful companion of St. Patrick (17th March), who consecrated him first Bishop of Clogher. According to legend St. Patrick gave his own crosier to St. Macartan when consecrating him. There is no further information on St. Macartan extant. MARK and TIMOTHY, in a letter to St. Justus of Vienne (6th May), Pope St. Pius I (11th July) writes of these two martyrs, describing them as having been trained by the Apostles, and encourages all to follow their example. It seems that circa 150 is a likely date for their repose, unfortunately there is no other information on these saints extant. PIGMENIUS, a priest in Rome martyred in 362 by drowning in the Tiber during the reign of Julian the Apostate (r. 361–363). ROMULUS and SECUNDUS (SECUNDULUS), (Date Unknown), two brothers who were martyred in Africa Proconsularis. As with so many of their contemporaries, all information on their lives has been lost.